Every year, home design trends are changing, and as new ones make their way into our homes, others get ditched. From tile trends to colour trends, they all play an important role in the design of our home. Which home design trend are you happy to see the back of? Vote and let us know of any other trends you'd like to say, sayonara! I don’t hate any of the trends shown. If you love it then have it. What I don’t support is slavishly following trends that are more fads just because they are everywhere. It is difficult when you like items that aren’t currently in fashion but it makes the hunt more fun. I'm with bigreader. Don't hate any listed. My dislikes are more like mismatched chairs, dark wooden beams and too open spaces. But what the heck, we are all different (thank goodness) and who really cares about trends? Hi ladies, nice to see you both here. I want to see the end of the word "trend" itself. We are encouraged to be creative and individualistic one minute, and follow trends the next. Couldn't agree more bigreader about how hard it is to buy things if they are not the current trend, it is so frustrating. I also hate creating a room of my choice and to my liking and the next year something I've done becomes a trend, my room just doesn't feel so special anymore and it makes me feel like just one of the sheep who have to follow every fashion, fad and trend that hits the market. Trends, particularly where colours are concerned can be very misleading too, just because a colour looks good in a photo, does not mean it will work in any and every room in a house - the size and layout of a room and light and aspect play such an important role in how colours react leading to disappointing results for DIY decorators. I dislike the current trend for grey tiles in bathrooms, they look like prison cells. I don't know that I would consider most of the list 'trends', apart from rose gold but I don't know how big a trend that is. I live in NZ and most of the new houses here are grey/charcoal/ neutral or white ... inside and outside. Kitchens are white and black and shiny, carpets dark grey, bathrooms grey ... Bring back the colours! I think I might be verging on a profound dislike of the very "popular" white, wide slat louvres or shutters on windows. GGMS they are all over Sydney and Melbourne and I am so sick of them. I'm over seeing grey everywhere. I think it was a useful neutral but now it's just too much. 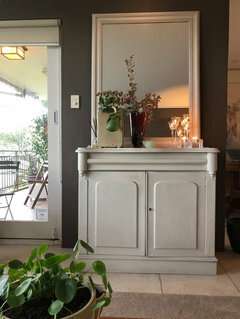 Kitchen islands with stoves or sinks built in. I am currently fixing a little shack house that I brought 1 year ago. The biggest problems I am facing are small box kitchen with no bench space or light and inadequate out door living areas. I won't go into many details but taking the indoors out is a real necessity for me. I feel claustrophobic when I walk into a house that can not be opened up to enjoy the outdoors. Natural light, easy flow from one room to another, practical layout with the hint of fun and comfort are big on my list. I would love to see the back of grey and the back of black as a main colour. They really need to be accent colors only especially in Queensland. I am with you, Dawn. I despise subway tiles, in any form. They make me think of school toilets. Rose gold! Something else will always look better. I hated off white or cream as the ‘go to’ colour for walls, but now I cannot tolerate the grey invasion. Everything is grey!! YUK!! What is wrong with white as the ‘go to’ shade and use what ever colour or colours you like anywhere and everywhere. Don’t change your decor based on trends, I understand it is good for business, but just buy things you like/love and keep them for ever, if you still love them. "Industrial" is my pet hate, especially in light fittings. Had a very hard time trying to find lovely colourful glass light fittings in recent years, with some stores not having even one item with colour. Grey and more grey is so depressing, echoing above comments. I suspect that trend is likely to become the 70's 'mission brown' of the recent era. My home is made from two shades of grey colourbond and with lots of large windows (double glazed for the Tassie climate) I have followed the grey scheme inside. I love it and thanks to some help from an interior consultant have used warm greys (with no yellow) overtones - it is possible!) throughout. This leaves me to highlight my favourite colours to match my moods, the seasons and the views without being a slave to the "trends". The most frustrating aspect of all this at the moment is the lak of choice of appliances. I am renovating my kitchen and wanted a white fridge/freezer but can't get it - have had to buy a matte black one - what's wrong with white? I'd be very happy to see the back of black - especially in kitchens and bathrooms. And charcoal grey too. A bit is fine, but great swathes on tiles or kitchen cupboards, benchtops and splashbacks are pretty hard to live with. The worst trend is drab grey everywhere. Beautiful bricks are painted grey. Timber California bungalows are painted grey. Can anyone name one artistic person who lives in a grey house? The trend to grey reflects the lack of imagination of the current era. You might have noticed I hate grey. You are the one living in your home, so design it the way YOU want it, trends come and go so it keeps the paint, furniture, décor etc business's in business, what I see on most of the live home shows I would NEVER even consider, if I like it I will source out what I need, if I cannot find it then I will try my best to make it, dye it or mix the paint to get what I want - it is not right that people have to buy only what is available in the latest trends when next year there is a totally new trend and you are classed as outdated - let the trendies have what they want but YOU have what YOU want. Monochromes have their place. It is sensible to style with a neutral background including core pieces such as sofa, carpet blinds/drapes, then add pops of colour of artwork, pillows, vase/flowers for example that are interchangeable seasonally as you wish. Trends are fine when you are just adding the colours or small items that are trending (as said in my previous comment). There is minimal cash outlay this way and you are still 'a la mode'. Colours are different in different lights. I recommend painting walls last then using large swatches 500mm square to look at colour effect in morning, afternoon and evening light. Furnishings reflect colour on surrounding walls as well. I agree with amandalouiselane's comment but greys can be beautiful with mauve or green tints for example...not battleship! Yay Ms Carolyn re the greys, we are on the same page! Amazed that a white frig is hard to find! Greys are gorgeous ... or should I say, were gorgeous in my newly renovated home some years back. And back then I would absolutely struggle to find anything to match my designs and colours up with, to say nothing of the ridiculous cost. Now, thanks to a glut of interior design and home renovator TV shows, every man and his dog is pushing and shoving to get a piece of the grey action! I am now bringing in indoor plants and decor like throws and rugs with a little splash of orange or red to start breaking up the look and not be labelled as a slave to fashion. But let’s be honest, Rose Gold and Subway Tiles HAVE to go. Unless you are a Saudi Prince or live in a Railway Station, they have no right to be masquerading as design elements! 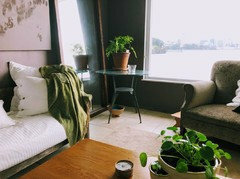 Greys and greens go so well in nature so indoor plants are lovely with grey walls, as sweetsofparadise2659 has commented. a throw in green also works beautifully! An example of warm grey and greens with terracotta. I hate 'White, White and White'. Its going to date just like Apricot! I keep waiting to hear the dentist drill! I don't mind white, it makes good background for all the colours you may want to put with it. But I had apricot in bathroom and kitchen years ago, and it just never looked clean to me. I'm over televisions on chimneys. Can't be good for either. I also find the lighting style that has the cord draped over a hook ugly. Home theatres. We can be smarter and more flexible and sustainable with space, with a bit of thought and design skill. Why do we even need home theatres. Homes should be where the family gets together and interacts, getting to know and understand each other. Modern technology has us becoming more and more detached from people - we are losing the art of conversation and people skills just mindlessly looking at screens. 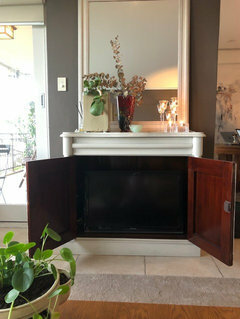 If you don't like the TV visible in the living room (as I don't), consider an armoire for your TV, or an old Chiffonier as in these photographs. Large armoires or chiffoniers can be found on Gum tree or Ebay, large enough to hold a suitably large screen. The family gathers round, some on floor cushions(!) when there is something everyone wants to watch...sometimes even family photo shots!! Personally I dont go by trends anyway. Everyone has there own individual style and your home is a reflection of yourself after all so make it yours and surround yourself with the colours and decor that you love and which reflects your own personality. I dont like seeing homes in magazines that are styled around a current colour theme, it would be very expensive to have to keep updating and re-doing them once the current trend is over and the next has arrived - especially at the end of the trend when you see all the decor products reduced to clear in the shops because its already dated and no one wants to buy them. But I am looking forward to when 'grey' is not the recurring colour in every home (inside and out). Nobody should ever follow "trends". Take kitchens: it's a workspace. It often gets messy (if you actually use the kitchen as God intended kitchens). So why does everyone go for a clinically clean look? It's a kitchen - not a dentist surgery. The only people who think handle-less, soft close, white cabinetry that hides absolutely everything is a good idea are sociopaths and fans of American Psycho. I have to say Stuart, when you have lived with a deaf person who will not acknowledge he even has a hearing problem, soft close doors and toilet sets are an absolute blessing. I would have even had padded benches if it were possible. I don't mind handleless either especially when you live near the ocean and salt spray attacks anything metal. so you can sneak around the house undetected? Finally - a use for soft close drawers! Haha, that is a devious way of looking at it, all I know it saved MY sanity. Olidroo, I agree with you. Soft close doors, toilet seats and not just for the people who cannot hear the noise they are making, for the grandkids too. Just about sends me crazy and also handleless drawers because of the same problem with the sea air. Even stainless steel. - wish they made plastic barbecues. The ubiquitous omnipresent 3 pendant lights, lined up above the kitchen bench. Ceilings smothered in downlights,pendants, smoke alarms, speakers, air conditioning ducts, security cams, etc. - ceilings have become an untidy mess. Butlers pantries stuck behind the show kitchen. Unless one has a butler. Ms Carolyn - soak some cotton balls in Peppermint Oil, put them in the ladder and they will get the message. What's the most annoying home building/design jargon? POLL: What is the most important thing to men in a "man space?" POLL: What's the best kitchen layout? POLL: What's your favourite kitchen splashback?